One of the outstanding tasks for full IPv6 support within Mythic Beasts was to make our graphing server support IPv6 only hosts. In theory this is trivial, in practice it required a bit more work. Our graphing service uses munin, and we built it on munin 1.4 nearly five years ago; we scripted all the configuration and it has basically run itself ever since. 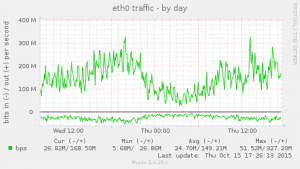 When we added our first IPv6 only server it didn’t automatically get configured with graphs. On investigation we discovered that munin 1.4 just didn’t support IPv6 at all, so the first step was to build a new munin server based on Debian Jessie with munin 2.0. Our code generates the configuration file by printing a line for each server to monitor which includes the IP address. For IPv4 you print the address as normal, 127.0.0.1, for IPv6 you have to encase the address in square brackets [2a00:1098:0:82:1000:0:1:1]. So a small patch later to spot which type of address is which and we have a valid configuration file. Lastly we needed to add the IPv6 address of our munin server into the configuration file of all the servers that might be talked to over IPv6. Once this was done, as if by magic, thousands of graphs appeared.